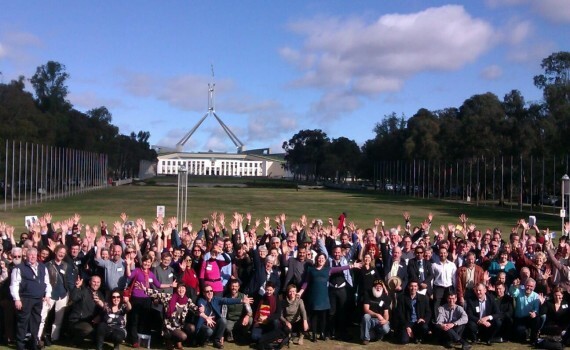 Holding an Event in Canberra? If you are planning to hold a Conference or Event in Canberra, Michelle and I are just back from running a 2 day Congress and I must say, it was an absolute pleasure to manage an event in the Nation’s Capital. The weather was extremely pleasant for winter and nowhere as cold as we had expected. We’d flown down armed with coats, scarves, hats and gloves – most of which stayed in the suitcase! An extremely well supported and received, inaugural event for the Coalition for Community Energy (C4CE), the 2014 Community Energy Congress. One and a half days were held at the National Library of Australia and half a day held at the Museum of Australian Democracy at Old Parliament House. The National Library of Australia was an alternative Conference venue to your regular hotel, and had a relaxed, welcoming feel which suited the event perfectly. The Member’s Dining Room at the Museum of Australian Democracy at Old Parliament House was a unique and interesting venue and it felt rather grand working in the full Member’s Dining Room. We had a “registration desk with a difference” located in the Entrance Foyer with a stunning view of New Parliament House (see photo above). Thankfully the delegates were inside working most of the morning, as it looked so tempting to run up these lush green lawns! The food supplied by the in-house caterers, Restaurants and Associates, was absolutely delicious. But remember, if you plan to hold an event in a heritage listed building, not to expect to stick anything at all onto the walls – which can be tempting in a workshop situation! We stayed close by to both venues, at the Pinnacle Apartments, which were comfortable and affordable, though we couldn’t quite summon up the courage to jump in the swimming pool! Being located in Kingston, the area had an array of international restaurants, so we had a huge choice. We enjoyed Turkish one night, and Chinese the next. Prior to the event, the Canberra Convention Bureau was a useful source of local information on places to stay, how to get around Canberra, etc. And, considering it was Parliamentary Sitting Week, on the whole, getting around Canberra was as easy and straight forward as usual. Just in case though, we made sure that we planned ahead, booking cabs and allowing a little extra time for their arrival and travel time. A perfect place to organise your next Conference or Event!